Thanks so much for the info! So you think I should go with the INV-7's instead of the INV-6? Great info, I really appreciate it. I'm going to order them so I get them in time for my trip to Oregon for the Yonder String Summit. I don't have time to mess with the Shure donuts anymore. I wish I knew about these Rycotes before I wasted over $60 on the donuts. I use the Avantone SSM with my 460/480 and find it's about the lowest profile mount that really works. Does it have a 3/8 thread on the bottom to screw onto my Shure vert bar's 5/8 thread? 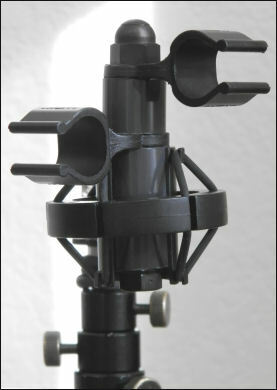 It has 5/8 threads for either the Shure vert or standard mic bars. The things are built like tanks, too. Heavy, but unbreakable. Great to know, thanks. I"ll try these before spending a boatload on Rycotes which are like $130 a pair. and most durable shocks per dollar. Are they durable? I have not had one in my hands. To me, it looks like it would be easy to break the clips or the support structure under them easily. The Rycote are the best and most durable around. I have now ditched all my shock mounts and gone over to Rycote for everything. You can put a Rycote on the floor, jump up and down on it, turn the Lyre inside out and tie it in knots. No harm is done and it all returns to its normal shape. They are perfect - and much much cheaper - and much better than the manufacturer originals. I would use nothing else, whatever the mic. 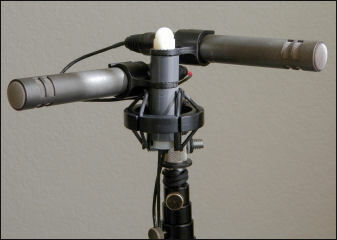 (And, yes, I use the Rycote on my Neumanns as they are better than the Neumann suspensions). 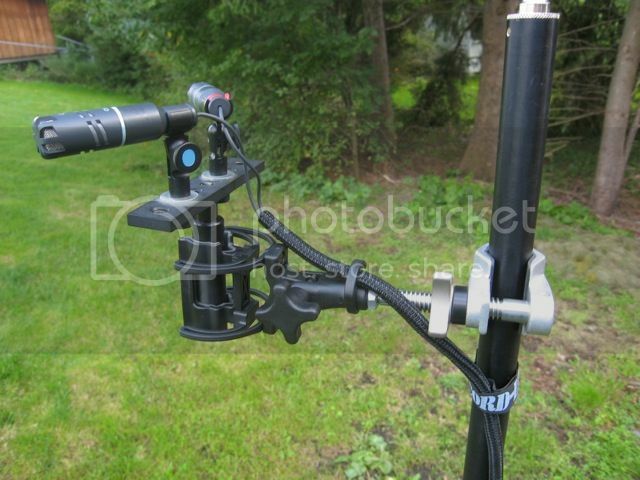 Here is a Rycote INV-HG mkII used with a Vark Bar and clamped to a stand using a Mini Cardellini Microphone Clamp with 3/8". It appears Rycote has recently replaced the mkII with a mkIII version, not sure what the difference is though.